Is The Gig Economy Inevitable? Airbnb is not popular everywhere nor with everyone – as seen in a recent spat with the Hotel Association of New York City. Uber’s battles have been perhaps even more public; with the parties involved seemingly even more vitriolic. The people who use them love them though, and they have changed things for a lot of people – users on both ends of the equation. People with seasonal jobs or working jobs that don’t quite pay the bills have jumped at the chance to supplement their income and make their money in this way. It is helping people to get through school, to work at the jobs they really want to work at, but not to suffer if they are in a low level entry position. Some people of course move away from their office job or factory job entirely, and have it as their sole source of income. 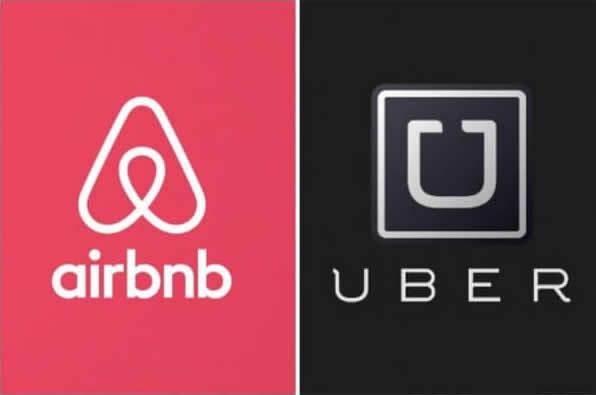 Airbnb and Uber have hit the rental business and the taxi / limousine business in the same way that Amazon did with brick and mortar stores in the book, electronics and other industry sectors. Understandably this has not left those operating on a more traditional business model very happy. In France, French Taxi drivers were turning over and burning Ubers. Hillsborough County in Florida regularly carried out sting operations to catch and prosecute Uber drivers for non-moving violations and not having professional chauffeurs licences. The battle went on for a year or more before the county eventually made peace with the ride-sharing app. Uber just lost it’s operating license in London and people aren’t happy about it. Consumers want to spend their money where they want to spend it, and the kind of regulation that Transport For London requires doesn’t necessarily itself to the way Uber has traditionally operated. Uber has had a lot of problems of late – Greyball, a program designed to allow Uber to avoid representatives of officialdom being at the center of a lot of them, and it has been trying to distance itself from that by changing CEOs, and performing a number of well thought out PR actions. Hurricane hit areas were providing free rides up to a certain amount to the shelters. Disruption has been a big thing in all fields of enterprise in the last few years, but the thing with the establishment is that it has a pretty firm footing from which to launch its fight against the new up-and-comers. Where those regarded as the establishment don’t have quite such a solid basis, they then have the need to fight to survive. In the same way, though, that the internet sent tendrils into every aspect of people’s lives, and the increasing functionality of smart phones has prompted lifestyle changes, the way the gig economy is structured is also rewiring the way people think about structuring a service, and how they construct the way employer and employee relate to each other. A lot of employees find it very attractive, despite the fact that for a lot of people it removes the safety net a traditional job might bring. Imagine you don’t get medical coverage from your job, you have to work hours that you don’t want to work, and you don’t like your boss – Uber might seem like a good solution. If you have a car and no real qualifications, or big gaps in your work history, but you have a good driving record, why not Uber? The age of the amateur may be upon us in many fields. In London Black Cab drivers spend on average 34 months learning The Knowledge, so it’s been a job that wasn’t necessarily easy to get into, so being undercut by non-professionals has to smart. A similar flare up happened back when mini-cabs first made their arrival on the scene. Change is painful for some, but seeing the death knell of one way of doing things and not working to find a way to survive the sea change isn’t wise. There are a lot of taxi cab drivers and chauffeurs who make the leap, but it is not like they don’t complain about the destabilization of the market. You have to work hard to make money at Uber, and you are basically on a 1099 as an independent contractor, so you aren’t getting what you would get as a professional driver. If the whole job market shifts towards that model it is really going to atomize the work force and change the relationship of the employer and the employee. It may be great for the customer if the lessening of overheads is reflected in the price of the service or product, but how long can that be sustained, and how likely is it if literally everyone is pulled into the so-called gig economy. That means it will be a level playing field and the quality of the service or product are going to be the deciding factor once more. This is at least in the fields where you don’t need a centralized workforce; and in the fields where automation isn’t going to render human actors redundant. Self-driving cars means Uber is not insulated against this, and in fact the company has even experimented with that them themselves. Customers will be the deciding factor. Laws that make the apps harder to use aren’t necessarily going to kill something that looks to be the future way of doing business. The pushback is reminiscent of the cries of those saying “too big to fail”, and the disruptive current environment and upheaval in all walks of life may not let that stagnant status quo abide.